New premium version of Rapid Classified released. 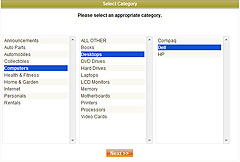 New Category Selector is available for v3.3. Fast, Ajax based with option to make 3-rd level category mandatory. New "Required Fields Plug-in" released for v3.3. Plug-in is intended to make any optional field a mandatory field and force a client to enter some value. New custom template developed and available for download. 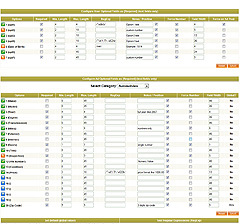 "Wonder" template features a new type of portal content - ads List with image and simplified box builders. Add-on for v3.3 to display ads submission prices (Credits Mode) to site visitors without logging in or creating an account. Update package contains replacement and new pages for RC v3.3 and called to facilitate to some degree ads posting in Credits Mode. If you are having problems with CAPTCHA at RC v3.3, then look here for information and update.